While serving as attorney general, Robert Kennedy wore his hair close-cropped in the style of the early 1960s. After a trip to the barber it could almost resemble a crew cut. But after President Kennedy’s assassination, he began growing it out. By the time he became a candidate for president in 1968, he had an unruly mop. Shrieking teenagers mobbed him like a Beatle, and his many enemies found an easy target. “All hair no brains,” read one hostile protester’s sign. Kennedy’s hair grew at the same rate as his radicalism. The more he spoke with fervent vagueness about revolution, the more he had to hand-comb it off his forehead, in the eerily familiar ­manner of his late brother. It may seem like a trivial detail, but as John Bohrer shows in “The Revolution of Robert Kennedy,” Bobby’s evolving look reflected a persona in flux. With JFK’s death, he no longer stood on anyone’s shoulders. As the 1960s wore on, Kennedy harnessed the most dynamic political force of his generation: the country’s youth. He not only spoke their language and addressed their concerns but looked like them. And he offered that most intoxicating of political aphrodisiacs: authenticity. He was blunt to a fault, and his ­favorite campaign activity was ­arguing with college students. To many, his idealistic opportunism was irresistible. It was an improbable reinvention. In his earlier life, Kennedy had developed a reputation as the family’s attack dog. He was a hostile cross-examiner on Joseph McCarthy’s Senate committee; a fixer and leg-breaker as JFK’s campaign manager; an unforgiving and merciless cutthroat—his father’s son right down to Joseph Kennedy’s purported observation that “he hates like me.” Yet Bobby somehow became a liberal icon, an antiwar visionary who tried to outflank Lyndon Johnson’s Great Society from the left. 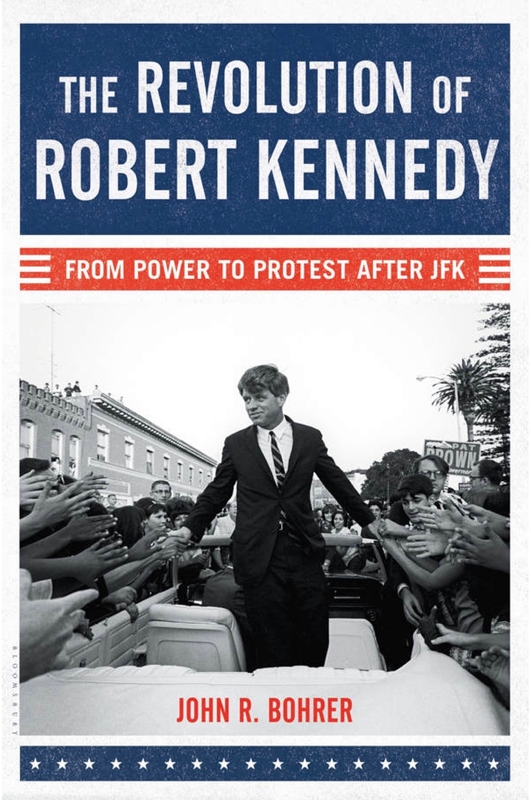 The bookshelves already groan with Kennedy titles, but Mr. Bohrer makes a worthy contribution by examining a critical chapter in Robert Kennedy’s public life, the period from 1963 to 1966. These were years in the wilderness, after his brother’s assassination and before his own storied campaign for president. ­During this time RFK learned who he was and decided who he wanted to be. Mr. Bohrer ably captures Kennedy at his lowest moment, far from Camelot, as he traveled the world, took public-speaking lessons, overcame his fear of crowds and grappled with JFK’s legacy. The loss of his brother nearly overwhelmed him. For months after the assassination he was prone to sudden tears and wore only black neckties. He showed a fierce devotion to the president’s widow and had an understanding with the guards at Arlington National Cemetery, who let him hop the fence and visit JFK’s grave after hours. Never the most urgent voice on civil rights, Kennedy had taken his lumps from James Baldwin and other black radicals in a Manhattan apartment in May 1963. Kennedy had requested the meeting in order to better understand growing racial tensions. What he got was a three-hour scolding on the daily insults of black life in America. Mr. Bohrer writes that Kennedy “didn’t let his pride overtake the lesson he learned that day” and that the word “insult” began appearing in his public remarks about race. Another mistake was Vietnam, a war Kennedy had helped engineer in his brother’s administration. Uneasy with ­Johnson’s escalation of the war, he nevertheless felt a certain ownership of the quagmire and was reluctant to criticize the new president. At first. Devastated or not, Kennedy was canny and opportunistic. He flirted with seeking the vice presidency in a de facto challenge to Johnson, only to run for Senate in 1964 instead, in New York and not Massachusetts (“Teddy’s there,” he explained). “Is this the East River?” he asked his driver during a ride in New York City. His campaign was heavier on machine politics and screaming fans than substance. Emerging from crowds, he found himself covered in scratches, his pockets stuffed with notes. Throughout these years, Kennedy kept a wary eye on Lyndon Johnson, a rival and adversary. Their feud has been described in Shakespearean terms, but Mr. Bohrer portrays it as a kind of slow boil, characterized by distrust, suspicion and misunderstanding. In 1964, Johnson embarrassed Kennedy by making him wait to receive an honorary pen at the signing of the Civil Rights Act. After winning his Senate seat, Kennedy seemed to thank everyone but the president. They praised each other in florid but hollow terms. The transcripts from Johnson’s White House phone calls capture the ­awkward embrace of two men ­dancing with knives in both hands. “Let’s, uh, let’s, uh, let’s, uh, let’s stay as close together as he’d want us to,” Johnson says to Kennedy, ­invoking JFK. “That’d be fine,” replies Bobby stiffly. You needn’t think that Robert Kennedy would have saved the world to recognize him as a fascinating politician of unfulfilled promise. His transition from thug to dove is as striking a reinvention as can be found in modern politics. Surly but vulnerable, entitled but idealistic, more passionate than his brother yet less elegant, he was a complicated statesman. No one could have achieved all that his fans believed possible of him. Yet it is a shame he did not get a chance to try.